My Saturday was one of the best days of my life. I went to Field Day. Here is some history of field day. Over the past year, the news has been full of reports of ham radio operators providing critical communications in emergencies world-wide. During Hurricane Katrina, Amateur Radio – often called “Ham radio” - was often the ONLY way people could communicate, and hundreds of volunteer “hams” traveled south to save lives and property. When trouble is brewing, ham radio people are often the first to provide critical information and communications. On the weekend of June 23-24, the public will have a chance to meet and talk with these ham radio operators and see for themselves what the Amateur Radio Service is about. Showing the newest digital and satellite capabilities, voice communications and even historical Morse code, hams from across the USA will be holding public demonstrations of emergency communications abilities. This annual event, called "Field Day" is the climax of the week long "Amateur Radio Week" sponsored by the ARRL, the national association for Amateur Radio. Using only emergency power supplies, ham operators will construct emergency stations in parks, shopping malls, schools and back yards around the country. Their slogan, "Ham radio works when other systems don't! " is more than just words to the hams as they prove they can send messages in many forms without the use of phone systems, internet or any other infrastructure that can be compromised in a crisis. More than 30,000 amateur radio operators across the country participated in last year's event. If you know me and know what a big radio nut I am. Then you should now that is what I love to do. During this year events I operated phone (or in non-radio term voice) communication on the 20 and 40 meter bands. I talk to people from all over the world. I even talked to a guy from Greenland. That was fun. The more contacts you make the more points you get. 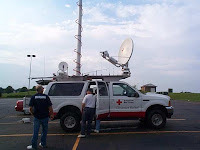 We also had some ham radio operators come from the Red Cross. They brought there radio truck. There radio truck is worth 1 million dollars. This SUV has a radio that can do any frequency in the world. 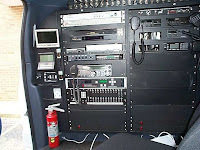 This SUV has, a local disaster operations center can have up to 48 phone lines, high-speed internet access, e-mail and satellite-enabled communications with national headquarters - all during a time when conventional phone and cellular calls are either knocked out, hopelessly overloaded or simply not available. Add to this an extensive computer networking system, a 50 foot pneumatic mast with closed circuit TV, satellite capability and lots more great stuff. 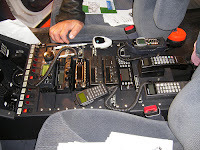 I have included some pictures of the SUV and radio that we was using. Wow! That looks like a lot of fun! It seems like it would be fun, not to mention interesting. It looks like I could have lots of fun, pressing buttons and seeing what buttons do what.How fun. glad to hear that you had fun and enjoyed yourself.